A FLOLOC is our industry’s most proven and reliable manufactured seismic control equipment. 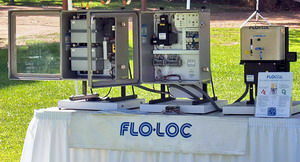 A FLOLOC is the only complete and integrated Seismic Control System with the necessary torque to close a valve in a broken pipeline. It has been developed to safeguard against additional serious earthquake damage to industrial facilities and installations. In our world, we all know that it is not a question of if but a question of when an earthquake will occur. Being ready gives you peace of mind as well as the knowledge that the best has been provided for the protection of others. An important plus of FLOLOC systems is simplifying and automating your regular operation in addition of protecting your assets. When an earthquake strikes, FLOLOC actuates valves to close immediately and intelligently, thus safeguarding the millions of gallons of water, chemicals, sewage, oil, or gas in storage and in pipelines. FLOLOC can also activate pumps off and on, shut down power, activate alarms and continue working for days when power is lost because it has its own internal DC power source. All FLOLOC systems can continue to be monitored and operated locally as well as remotely. Our job is to make your job easier and more cost-effective.